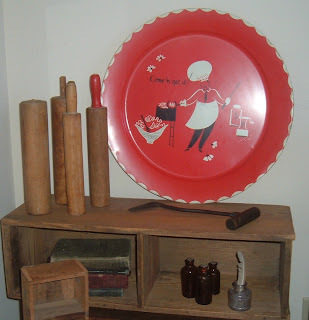 When I got up this morning, I was looking at all of the fun vintage farmhouse pieces I have listed or will be listing in ImSoVintage and decided to create a display for a kitchen. I had to clear out a little space, but had lots of fun putting it together. I love stacking old suitcases to create tables, but here, I tiered an old suitcase, antique wooden trunk, and rustic tool drawer laid on its side to make a functional side table for a kitchen. It would actually be great in any room in the house with a change out of accessories. Usually, we tend to stack with the widest piece at the bottom, but I thought it would be fun to put the widest at the top. Love these display pieces. The old rolling pin parts have a great sculptural look, the 1950s tray is positively adorable, and I can never get enough of primitive old boxes, kitchen utensils, and bottles. The idea is to have fun with what you have around your house. 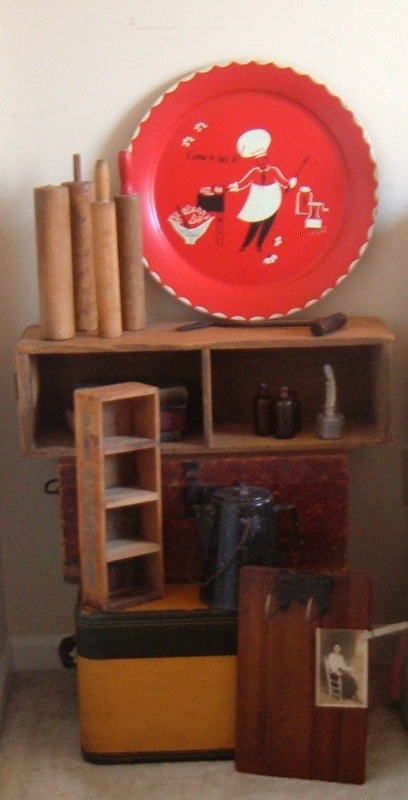 Put things together in new ways, and add a few new finds to give yourself a whole new look. I want to thank everyone for their lovely comments on yesterday's post. They really gave me a boost. I so wish I could get out all my vintage finds and display them. My house is so small that I have to wait for DH to build some shelves to line the wall for all my finds. Great finds!